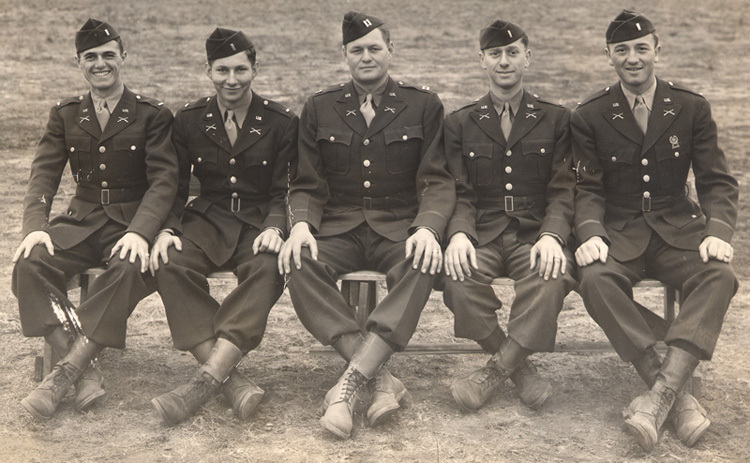 During WWII my Dad, Richard Keefe, served in Company I, 304th Regiment of the 76th Division. 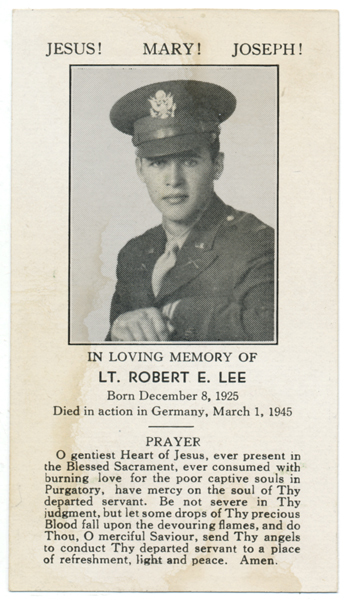 A close friend of my Dad’s was Robert E. Lee, 1st Lieutenant, Company E.
What follows is an account from the Regiment history of his final moments. Lee was 19 years old. The rest period ended for the men at noon on the 1st of March when the troops were ordered to relieve the 3rd battalion southeast of Gilzem. Easy Company spear-headed the advance through this town, which was in friendly hands, and bore the brunt of the attack on Kunkelborn. Immediately after arriving at the front lines, E Company supported from the left rear, with G Company advancing through a draw northeast of the town. The 3rd platoon was the assault element followed by the company weapons platoon and, as they approached, they ran into a hail of rifle fire. Lt. Robert E. Lee, (0551073) the weapons platoon leader, ordered the machine-gun section into action but, turning, discovered that he had only one of the two guns and that only one crew-man remained. Instantly he fed the gun and directed 1st fire until he was fatally wounded. Sgt. Thompson then Pfc., picked up the hot gun in his hands, moved to another position and finished the mission. As a result of their action sufficient covering fire was laid upon the enemy to enable the assaulting riflemen to overrun the positions. . .
Mass card my Dad kept with his personal belongings. What struck my Dad about Robert Lee dying was that Lee was one of the best. They were young and thought themselves invulnerable – which of course wasn’t the case. The casualty rate for Company I was one of the highest in the battalion. The following is a list of the men killed in action from the Company in remembrance on Memorial Day. This entry was posted in Company I and tagged Company I, Memorial Day, Richard Keefe, Robert E. Lee. Bookmark the permalink. My great uncle is Don Katz :), the same one your dad served with. If you aren’t already aware of it, here’s a Company I video your great uncle Don is featured in as well. Great to make your acquaintance – all the best!